Last evening the search for the perfect Veal Chop came to a delicious conclusion. After an extensive search, the out-and-out winner was The Smokehouse of The Catskills. It was tender, tasty and terrific. Cooked slightly beyond rare to 120 degrees, all that’s left to say is “thanks Mike and Heidi”. 1. Season the Veal Chop & add 1 TB of EVOO. Set aside until time to cook. 2. Heat the oven to 375 degrees. 3. Heat a non-stick grill pan to smoking high. Add the second TB of EVOO. Place the Veal Chop in the pan, weighed down with a grill press, for 3 minutes to a side. 4. Move the pan to the oven for about 5 minutes. The internal temperature of the Veal Chop should be 120 degrees for slightly above rare. Remove & cover with foil or place in the cooled down oven to keep warm. 5. Place the baking sheet with the seasoned & oiled Shiitake caps in the hot oven for about 10 minutes. 6. Remove & keep warm. Fennel, Scallions, Red Bell Pepper, Belgian Endive, Tomato, fresh Oregano leaves. 1. Cut all the vegetables to a 3/4″ dice. Add the Oregano leaves & Red Pepper Flakes. Add the EVOO & toss together. 2. 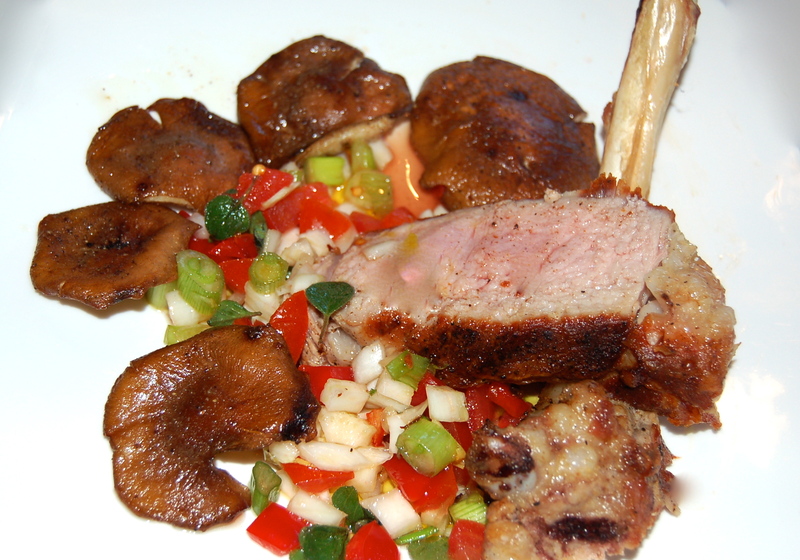 Plate with the Veal Chop & the Shiitakes.